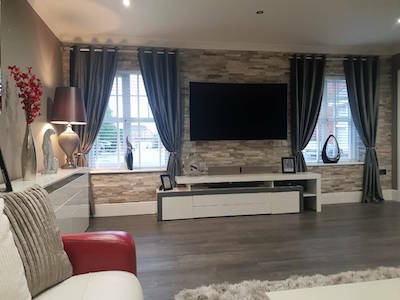 Feature wall in lounge using Eazyclad split face oyster stone cladding panels a very easy to install and maintain veneer that is very versatile which can transform the appearance of any room it can also be used in other internal spaces around the house or work place. They are mad by bonding strips of quartzite that are multi coloured in light creams, beiges greys and light brown with some pinks thrown in. Each tile is made in a Z shape so you can achieve a seamless joint when attaching to the wall and they measure 600mm in length by 150mm in height with a thickness of approx 8-13mm. Sold in boxes that contain 7 panels which will cover .59 of a square metre and for delivery purposes we can get 28 square metres on a pallet.